Oran Kearney won’t be shooting starry-eyed glances at Brendan Rodgers when he kicks-off his Paisley reign against his coaching hero. 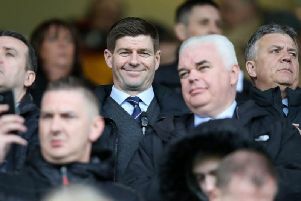 The new Buddies boss is looking forward to pitting his wits against his fellow Northern Irishman when Celtic visit the Simple Digital Arena tonight. The former Coleraine chief – who hopes a deal for Anton Ferdinand can be rushed through in time to see the ex-West Ham defender face Celtic at the Simple Digital Arena – is a big fan of the double treble-winning Parkhead manager, a man he believes is the standard bearer for aspiring coaches in his homeland. The pair have never met but Kearney did call up Rodgers during the summer to seek advice as he came close to securing the Saints job before Alan Stubbs’ doomed appointment. He then received a congratulatory text last weekend after landing the post at the second attempt. However, Kearney, pictured, says he will not be looking for autographs when he finally goes head to head with Rodgers. “I’m looking forward to locking horns with Brendan – professionally and from an ambition point of view,” he said. “He and Michael O’Neill are the standard bearers for what can be achieved for coaches from my country. Both those guys have been exceptional in what they have achieved in a short period of time. I had a good conversation with Brendan and also Neil Lennon before my first interview in the summer and when I was flying across here on Saturday morning I got a nice text from him welcoming me across and saying he was looking forward to Friday night. “Did I ever think anything like this would happened to me? It’s hard to say. But now that it’s real, I’m not going to be standing ogling Brendan on Friday night and looking for autographs. Kearney confirmed talks with Ferdinand are ongoing and hinted he would be ready to throw the 33-year-old straight into action. “We’re in negotiations but it’s a matter of whether we can get it over the line in time. Reports have suggested former St Mirren boss Gus MacPherson could be lured back to Paisley as the club’s new technical director. And Kearney believes it is a role which could help Saints avoid repeating the transfer mistakes which ended up proving to be Stubbs’ downfall.